• The LVS-9510 inspects all nine of the ISO (ANSI) parameters, plus added features of determining blemishes, opacity, and human readable validation. The LVS-9510 also verifies 2D codes and reports all parameters as specified in the applicable symbology specification. • Analysis is color coded to show exactly where the problem is located within the barcode, and sections of the barcode can be analyzed to determine how to solve the problem. Reference to an online help screen assists in the analysis. • High-resolution inspection of the barccode is possible due to the use of a 5.0 megapixel high-resolution camera, which allows reading and analyzing every two thousandth of an inch (.002"/.05 mm) of the barcode height; this exceeds the minimum ten-scan average required by ISO. • Certified by GS1 US for the UDI (Unique Device Identification) requirement issued by the FDA to medical device manufacturers. • 21 CFR Part 11 compliant-ready for all FDA regulated industries. • Multiple codes, including any combination of Linear, 2D (such as Data Matrix, QR Code and Aztec Code) and Stacked Linear (such as PDF 417, Micro PDF and Composite Codes) can be verified on one label within the field of view. • The LVS-9510 was formerly known as the Integra 9510 by Label Vision Systems. Multiple codes, including any combination of Linear, Matrix (such as Data Matrix, QR Code and Aztec Code) and Stacked Linear (such as PDF 417, Micro PDF and Composite Codes) can be verified on one label within the field of view. LVS-9510 is a high-performance system for off-line verification of barcodes to ISO/IEC, ANSI, GS1, and UDI standards. The LVS-9510 is unique in the world of ISO verification due to its ease of use and ability to verify linear (1D) and two-dimensional (2D) codes without any change of equipment. The system automatically determines the symbology and aperture needed to evaluate the code and identifies and highlights trouble spots. LVS-95XX series barcode verifiers inspect all nine ISO/ANSI parameters for linear (1D) barcodes, have the ability to identify blemishes, and can perform simple human-readable validation. Equipped with numerous analytical tools to identify and evaluate barcode errors. Problems are color-coded to make problem solving easy. LVS-95XX software includes GS1 System Symbol Specification Tables. GS1 tables set standards for barcode data structure and how to maintain the quality of codes during barcode creation. Microscan offers an online training course on GS1 tables and how these apply to different organizations. Manage permissions through LVS-95XX software: Passwords are stored in a local database. All passwords are encrypted, include an expiration date, and count failed password attempts. Manage permissions through Microsoft Active Directory: User privileges are based on Microsoft authentication and LVS-95XX permissions are assigned based on group membership. The LVS-9510 was formerly known as the Integra 9510 by Label Vision Systems. The LVS-9510 is a replacement for the LVS Integra 9505. 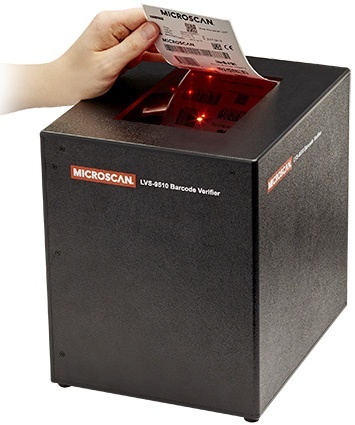 Select Product * Please select product Half-Day On-site Installation and Training MicroScan LVS INTEGRA 9510 desktop 1D and 2D barcode verification system - DoF= 6.25" MicroScan LVS INTEGRA 9510 desktop 1D and 2D barcode verification system - DoF=1.75" MicroScan LVS INTEGRA 9510 desktop 1D and 2D barcode verification system - DoF=3.0" MicroScan LVS INTEGRA 9510 desktop 1D and 2D barcode verification system - DoF=4.0" MicroScan LVS INTEGRA 9510 desktop 1D and 2D barcode verification system - DoF=4.5"